My alarm went off this morning and the radio started playing. I was still in bed half asleep and then I hear that someone passed away. I was curious who it was so of course I looked it up. 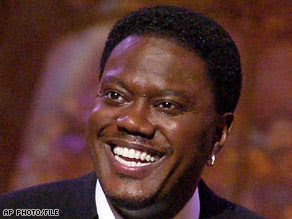 And it was comedian Bernie Mac. Sad…RIP! CHICAGO, Illinois (AP) — Bernie Mac, the Emmy and Golden Globe nominated actor and comedian who worked his way to Hollywood success from an impoverished upbringing on Chicago’s South Side, died Saturday at age 50. “Actor/comedian Bernie Mac passed away this morning from complications due to pneumonia in a Chicago area hospital,” his publicist, Danica Smith, said in a statement from Los Angeles, California. You can read more here at CNN.com.